Heading to the Canadian Rockies and wondering what to do in Banff National Park and Lake Louise? 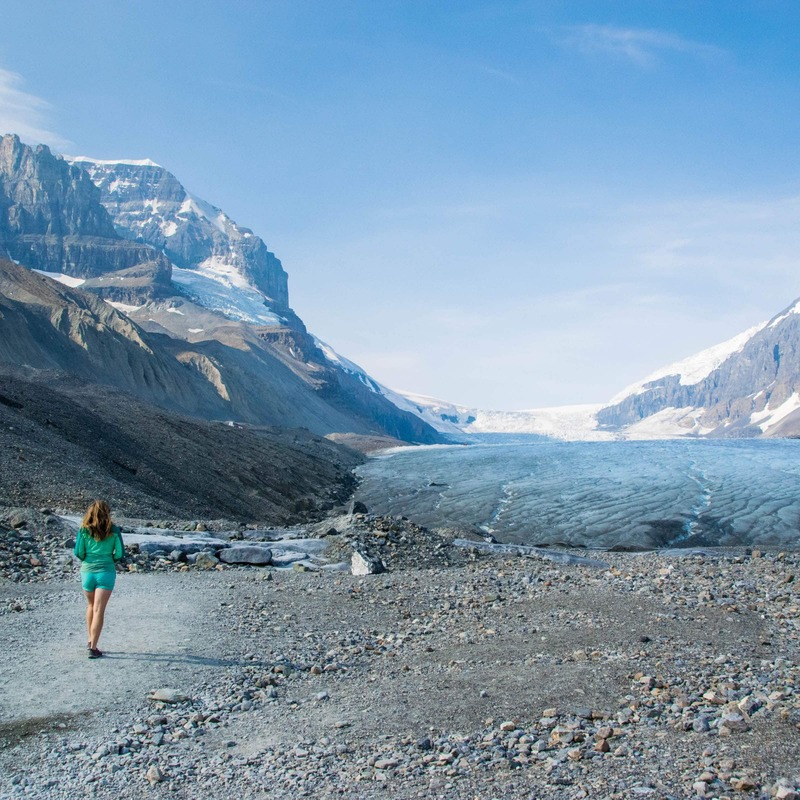 Wonder no further with this list of things to do in Lake Louise and Banff National Park. Whilst Lake Louise is part of Banff National Park, you might hear people separate the two, or refer to it as Banff Lake Louise. 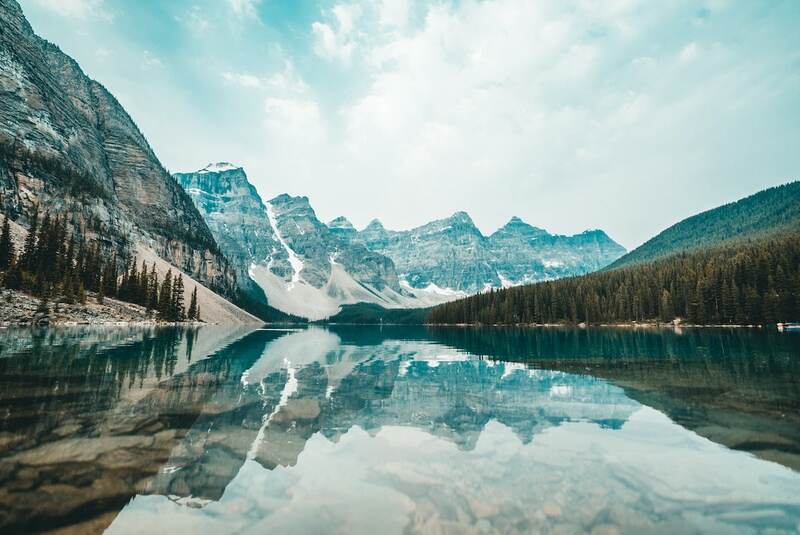 They’re the same place and, since you find Lake Louise in Banff National Park it’s also included in this list of things to do in Banff Canada. 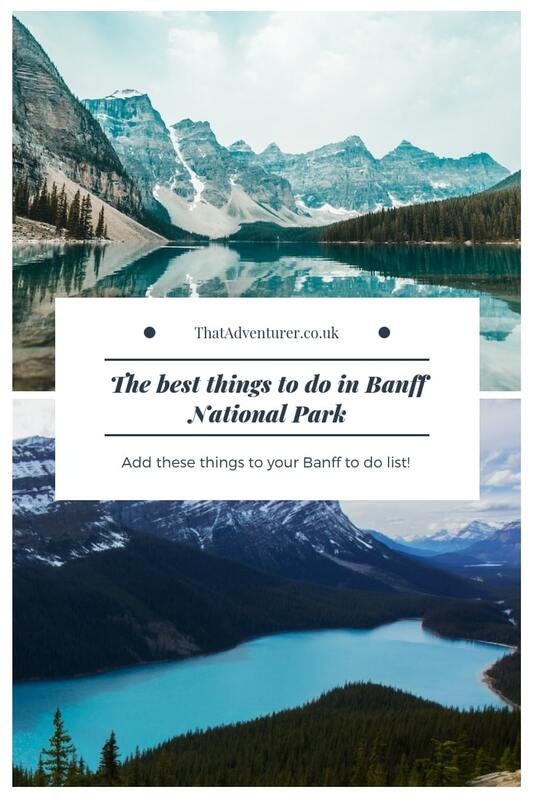 Consider this your Banff trip planner for Banff adventures! When is the best time to visit Banff and lake Louise? 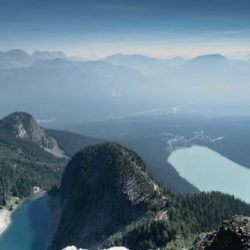 Want more posts from the Canadian Rockies? 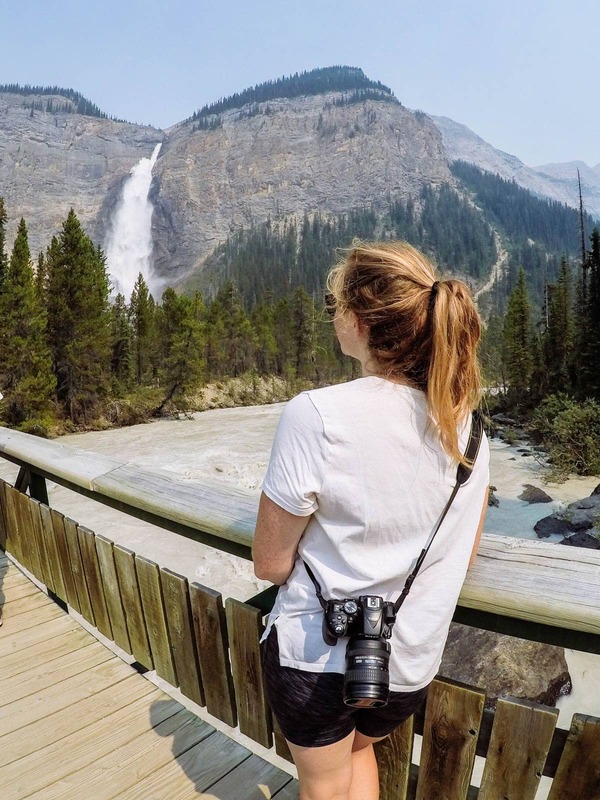 If you’re wondering what to do in Banff National Park then add these places to visit in Banff to your Banff itinerary. 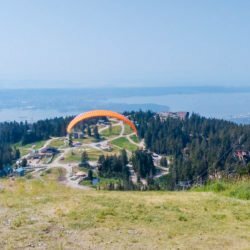 These fun things to do in Banff apply more to the summer, but most of these also make great Banff winter activities (with the exception of some of the harder hikes mentioned as it’ll likely be super snowy!). Find the best of Banff with this handy map. Add it to your phone and you’ll be able to see these on your Google maps app so it’s like you have your very own Banff tourist map and map of Banff and Lake Louise. You’ll have seen this famous lake all over your Instagram feed. 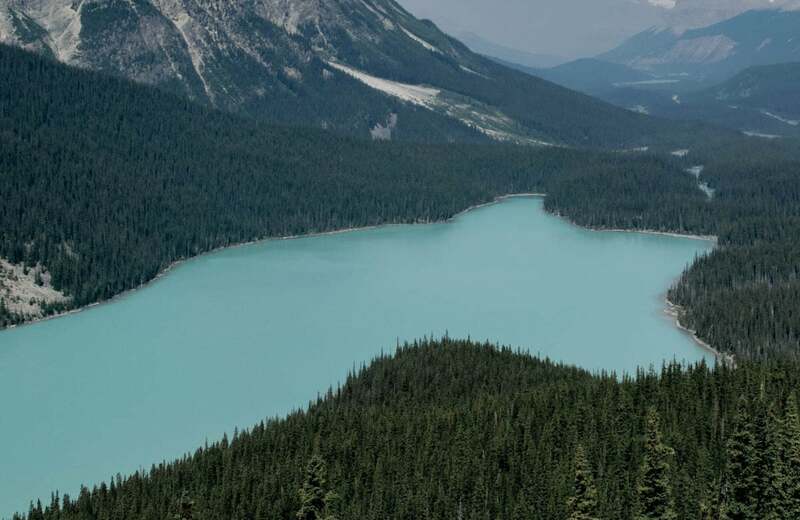 Yes Banff is home to many gorgeous lakes and Peyto Lake is one of the best lakes near Banff national park. The lake is named after Bill Peyto who was a pioneer, mountain guide, and early park warden of the Banff National Park. Is it the shape of a dog, fox or a wolf? You decide! This super blue lake is easily accessible with a 10 minute, slightly uphill walk from the parking lot. It gets super busy here, as with pretty much everywhere in Banff and Lake Louise but since it’s such a short hike parking spaces become available pretty quickly. 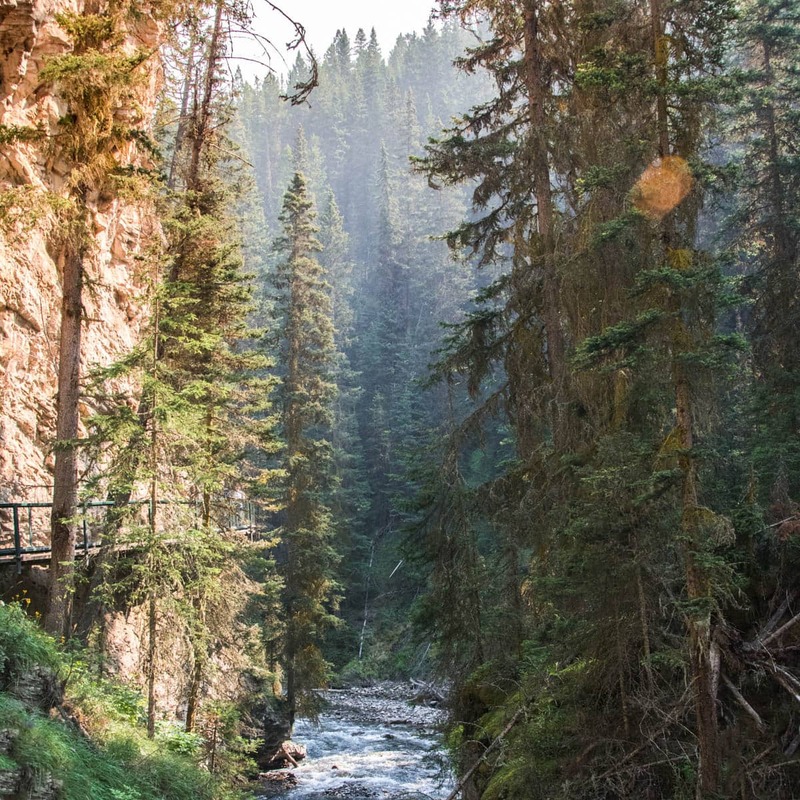 Personally I think Johnston Canyon is as little overrated but I’d advise you to check it out for yourself still as it’s often rated as one of the top Banff attractions. When we visited in the summer you’d have to queue around 20 minutes to see the waterfalls towards the back of the canyon. I’d advise going off season or early or late in the day if you’re visiting Banff in summer. The water is pretty though and there are several hikes in the area that you can do to escape the worst of the crowds such as the hike to The Inkpots. Two Jack Lake is a beautiful place for sunset. It’s right by Lake Minnewanka so definitely stop by here after your afternoon at the lake. If you have your own sup board or kayak then this is the lake to take it out on! Banff has some many options for camping. The lakeside spots at the Two jack campsite are some of the best but they get booked up very quickly! We spent a couple of nights at tunnel mountain village 1 and found it very peaceful. 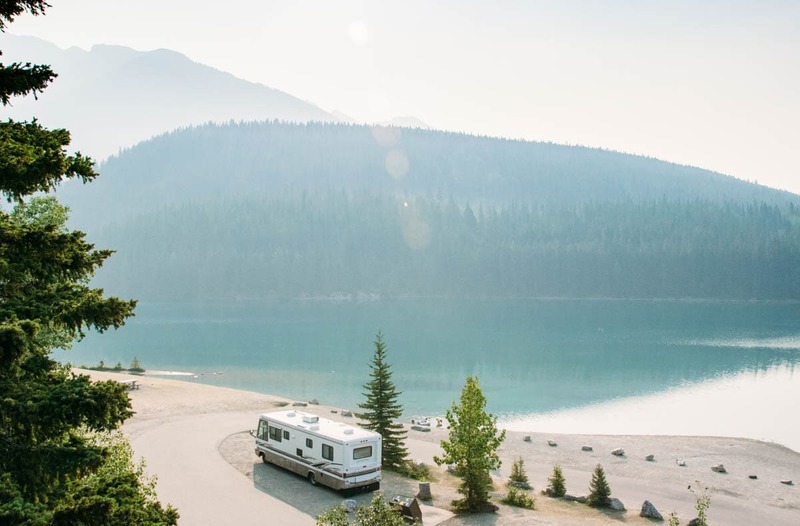 Camping in Banff National park is one of the best things to do in Banff in summer. For all the campsites In Banff check out this list. This massive lake is a glacial lake surrounded by mountains. It’s a great place to go for a chilled out afternoon at the lake. Take a boat ride, hire a boat at Minnewanka Lake, kayak, canoe, swim or read a good book. The choice is yours! Banff is one of the bigger towns in the Rockies so make the most of it one day and treat yourself to brunch at one of the many restaurants. We liked Coyotes Southwestern Grill for a Mexican inspired brunch feast. Whilst we didn’t do this since it was so smoky on our visit to Banff, it looks like it’s be amazing on a clearer day. A top tip is to check the Banff webcam before you go up in the gondola. When our friends visited the town was rainy and grey, but they’d checked the webcam beforehand and had seen it was beautiful up the top as you’d be above the clouds. Tickets for the Banff Gondola cost $58 per adult if you book in advance, $64 on the day. Lake Louise the town doesn’t have a huge amount to offer but we’d recommend getting lunch at the Bill Peyto hostel after a great day hike in Banff (link). 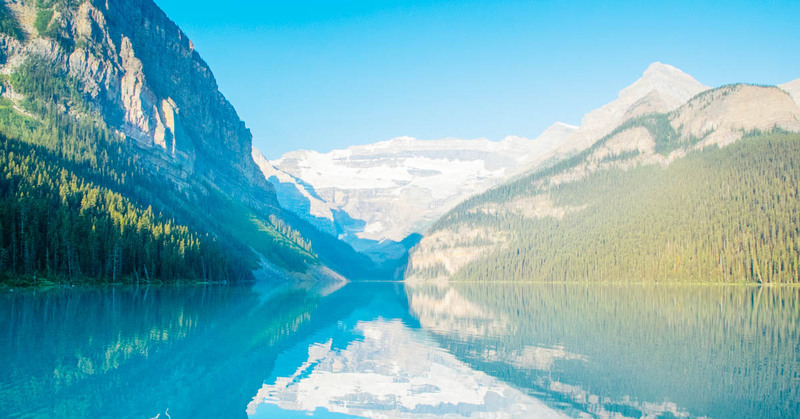 The lake named Lake Louise is what you’re really here for. At Lake Louise you can hire a canoe, gaze at the Banff castle (aka the Fairmont hotel, Banff) and take a hike. The lake is beautiful but the hikes around it are, in my opinion, the best bit since they offer you a great view from above. 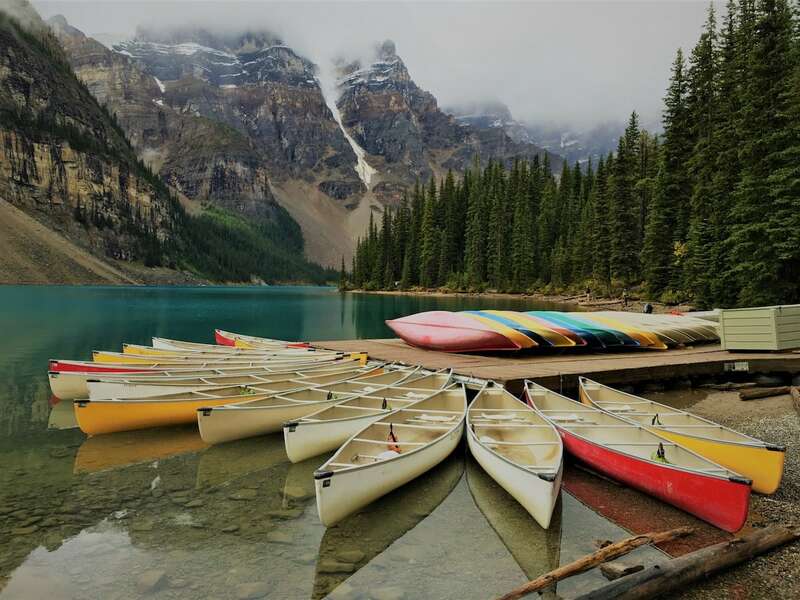 During the summer months Lake Louise and Moraine Lake get super busy. You’ll need to be at the carpark for Lake Louise by 8am to secure a parking spot. Once the spots are full you’ll have to pay $10 for the shuttle to Lake Louise. One of the best hikes in the lake Louise area is the hike to Lake Agnes tea house. 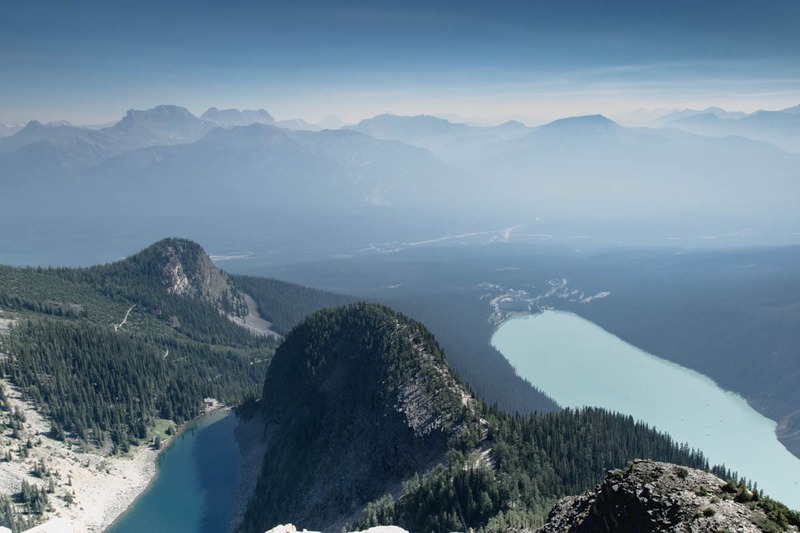 This is also one of the most popular hikes in Banff so be prepared for it to get busy and there’s an extra lake which is one of the top things to see in Banff. If you’ve arrived at the car park in Lake Louise early then the trails won’t be too crazy yet. The hike is fairly steel through a series of switchbacks, a good place to rest at mirror lake and then finishes off with a waterfall and some steps to Lake Agnes Tea House and Lake Agnes itself. Is definitely recommend stopping in for biscuits (scones) and a lot of tea! The staff here camp at the tea house for several nights and are responsible for carrying up the supplies and carrying down the trash too. I think this would be such an awesome summer job! Moraine lake might just be the most famous lake in the Canadian Rockies. And for good reason. No one can visit Lake Mrraine and not be impressed. This is probably the Banff lake you’ve been picturing. It’s also incredibly busy during the summer. Be aware that you may have to arrive at the parking lot for Lake Moraine before 6am. Arrive any later and you risk the road being closed. If this happens you can get the shuttle from the overflow car park in Lake Louise but this is a bit of a hassle and it costs too. Hiking to the Devil’s Thumb takes you first along the Lake Agnes Tea House trail and then follows the beginning of the popular Beehive trail too. It’s one of the best hikes in Banff in my opinion but it does have a fairly tricky scrambling section and some very narrow trails. 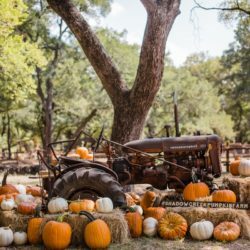 It’s definitely a difficult hike compared to the other options in the area but if you’re an experienced hiker you’ll love it! One of the top Banff activities is to go and soak in the Banff hot springs. This is one of the best things to do in Banff in winter or after a hike in the summer. It’s also one of the more romantic things to do in Banff. Banff Upper Hot Springs are the highest operating hot spring in Canada. Entrance is $8.30 for adults and includes a locker token too. The Vermilion Lakes are pretty close to the centre of downtown Banff. Exploring them by canoe is the best way to see them. The lakes are backed by marshland and have awesome views of Mount Rundle and Sulphur Mountain. 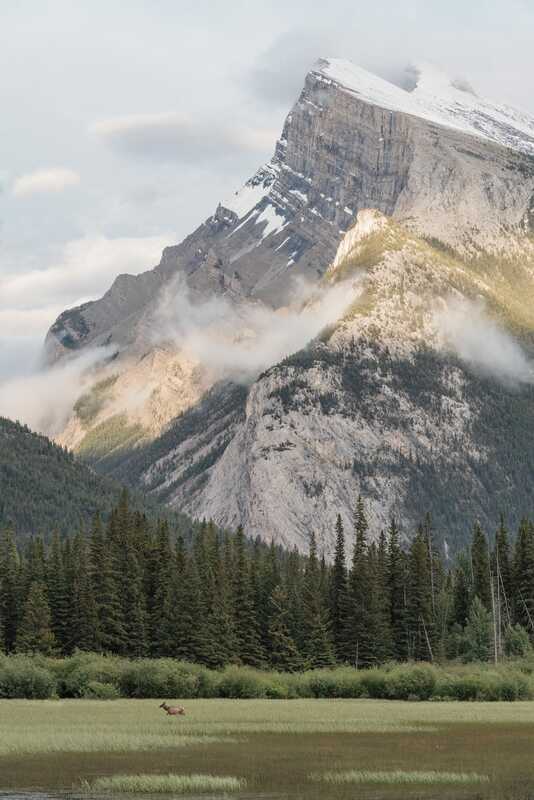 You may even see elk, moose, and the occasional bear as you paddle or walk some of the trails around Vermilion Lakes. Another great hike in Banff is the switchback heavy hike up to Tunnel Mountain. 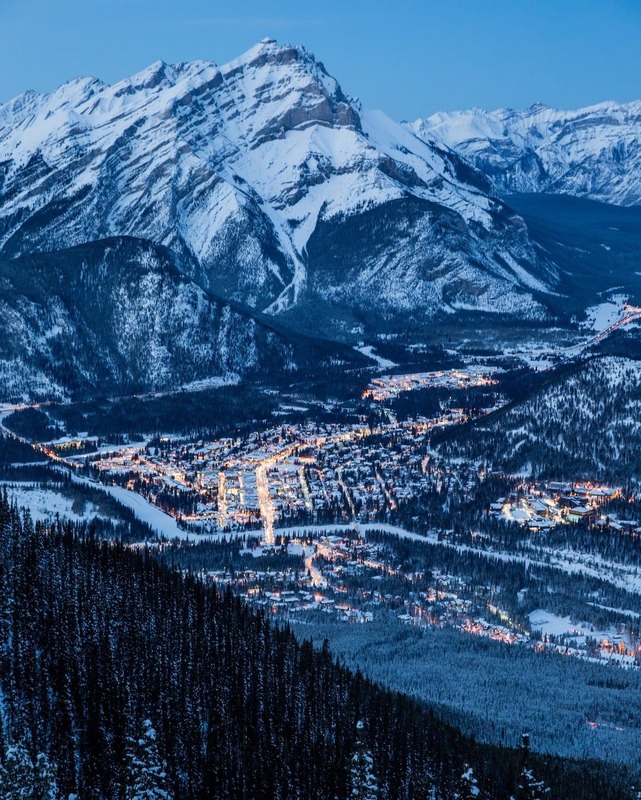 This is far from being a wilderness hike but you’ll get amazing views of Banff downtown from up here. The Bow Valley Parkway is one of many scenic drives you can do in Banff National Park. On this drive you’ll twist your way through forest and past the magnificent Castle Mountain (you’ll understand the name when you see it!). Keep your eyes peeled for wildlife! Why not pop into another Canadian National Park for a day during your Banff vacation? Yoho National Park is in the province of British Columbia and it’s home to some incredible mountain peaks. It’s just a few minute’s drive away from Lake Louise and it’s usually a bit quieter than Banff too. The Icefields Parkway is undoubtedly one of the most scenic drives in the world. I’d recommend at least two days to travel up or down it. 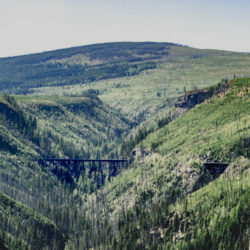 It starts just outside of Lake Louise and stretches up to Jasper. However, not all of it is technically part of Banff National Park. The Banff section of the Icefields Parkway goes up to just south of the Icefields Centre. I’m sure you’ll all know that Banff is in Canada. But, to be more precise, Banff is in the province of Alberta and very close to the border of Alberta and British Columbia. Banff National Park is in the Canadian Rocky Mountains and you’ll very quickly understand why it’s so popular! The best times to visit Banff are in the shoulder season: that’s spring and autumn/fall. I visited during the first week of August and it was incredibly busy as it tends to be during a Banff summer season. We had to arrive at car parks for popular spots such as Lake Moraine and Lake Louise before 6am or they’d be full. We’ve had friends visit during September and they’ve said it wasn’t as busy as that. Be aware though that Banff weather is pretty unpredictable. In early September our friends awoke in their tents to about a foot of snow. Banff temperatures range widely. From November – February don’t expect it to get above freezing, while in the summer months you could be looking at mid-high 20s (that’s celsius!). If you visit for a Banff winter then make sure you have snow tires and ideally a 4×4. The roads will be kept pretty clear but you’ll feel better in a 4×4 and snow tires are a must. Banff hotels tend to be very expensive. You can save money by staying in one of the towns near Banff (such as Canmore), or by camping. I’ve picked out some of the best hotels in Banff. These places to stay in Banff are suitable for all budgets. 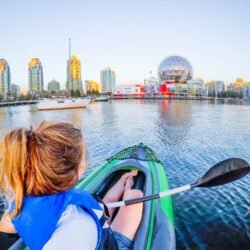 If you’re traveling to Banff National Park from outside of Canada, or from a bit further away within Canada, you’ll likely fly into Calgary. It takes about 2 hours to get from Calgary airport to Banff National Park. Just follow the Trans-Canada hwy 1 westbound. Need to book flights? I always recommend Skyscanner for finding cheap flight deals. They haven’t let me down yet! If you’re driving from Vancouver or elsewhere in BC, then head eastbound on Hwy 1 eastbound via Kamloops. The drive takes 9-10 hours but can be broken up by stopping in The Okanagan or elsewhere. You’ll get to Lake Louise before the town of Banff which is a little further south. Need to rent a car? Check out RentalCars.com which makes it super easy to compare car hire prices and pick the best one for you.